I learnt that in Riewoldt’s view, illicit drug use among AFL players is “out of control”. 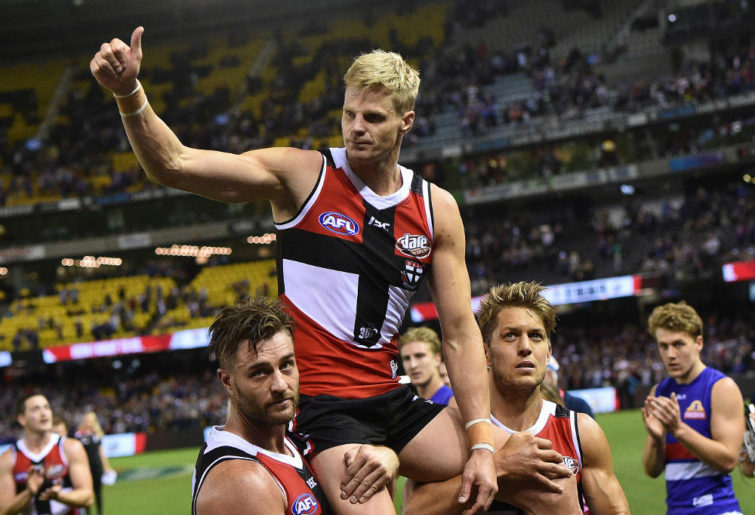 I learnt that Riewoldt believes that the AFL should take a “tougher stance” on the issue, and that during his playing career he had lobbied them to do just that. I learnt that Riewoldt believes that if the “three strikes” policy were changed to a single-strike policy, whereby any player caught using recreational drugs is suspended immediately, it could help stamp out drug use among footballers. The only thing I didn’t learn was why I should care. Seriously. Why should I give a flying fricassee about what substances professional sportspeople chuck into themselves? Performance-enhancing drugs, sure – I’m a sports fan, and so anyone seeking an advantage outside the rules rubs me up the wrong way something chronic. If players found taking steroids are rubbed out for years on end, that’s fine with me. Likewise if they take the field under the influence, I’d fully support their club coming down like a ton of bricks on them for letting the team down. But drugs they’re taking for fun, in their own time? I have no idea whether I speak for millions or just for myself when I say this, but big freaking whoop. Frankly, if I were to agree with Nick Riewoldt’s straight-edge philosophy, I’d be pretty hypocritical. Most of my friends have consumed illicit substances at one time or another, and I’d be furious if, having consumed those substances during their leisure time, my friends were subjected to disciplinary action by their employer for a matter which is frankly none of their employer’s damn business. Oh but it’s illegal, you – and Nick Riewoldt cry. Yes it is. It shouldn’t be, but it is. So if a player is breaking the law, feel free to go tell the police about it. The distinct lack of “football star imprisoned for popping eccies at rave” stories in the news cycle suggests the cops don’t particularly consider it a high priority, but I’m absolutely willing to concede that if a footballer is in jail, he or she will probably have to miss a bit of footy. If you or Riewoldt are that much into law and order, go ahead. Be a dobber. Personally I think it’s none of my business. Maybe you think it’s some of yours. It sure isn’t any of the AFL’s. Perhaps the biggest reason I don’t care even a little bit whether AFL players are stuffing themselves full of mind-altering substances every weekend is that I know for a fact that there is one mind-altering substance that almost every footballer does stuff himself with regularly, and they don’t even go to any great effort to hide the fact. Alcohol is as closely entwined with football as Stephen Silvagni with the torso of a full-forward, and it causes more damage to players and those unfortunate enough to venture into their orbit than every other drug combined. Think of every footballing scandal. Every assault, every act of public indecency, every loss of bladder control, every offence against persons, property and general society that footy stars hit the headlines for – the one common factor is is not pot or coke or speed or ecstasy or acid or ice or heroin. We know what it is and we know the destruction these young men so often wreak upon themselves and others when they’ve been drinking. But Nick Riewoldt will never, ever, ever call for alcohol bans. He’ll never demand the AFL crack down on drinking. He’d rather demand even more draconian measures be taken in the league’s endless war on harmlessness. Now, one might say that footballers taking drugs sets a bad example, and it’s true, it does. I definitely don’t want my kids taking drugs, and I hope they never see a famous sporting hero take them and decide on that basis that it’s a good idea. But I also love playing my children music by legendary drug-takers without suffering a crisis of conscience. More importantly, the only way drug-taking footballers set a bad example is if their drug-taking is made public, so Riewoldt’s suggestion that they be suspended for a first offence would actually make the risk of bad example-setting far greater. If all we’re worried about is the example we’re setting, we have a powerful incentive not to crack down on druggies, but to keep the whole issue a secret from everyone. Drugs, I would like to make clear, are bad. I’m not a fan of them. But I’m also not a fan of empty, pointless moralising. Footballers who take drugs might be hurting themselves. But they’re not hurting me. They’re not hurting you. They’re not hurting Nick Riewoldt. And it doesn’t matter in the slightest to the game itself. I don’t care. The sooner the AFL stops caring the better.